While a backyard fire pit can be another focal point in a well-designed landscape, the structure is also an additional focal point for group fun and enjoyment on a cool, starry night. Whether for relaxing and enjoying the space with family and friends or simply providing a place to lean back and reflect on the day’s activities, a beautiful manufactured stone veneer firepit provides another great option for homeowners to enjoy their outdoor space. An outdoor fire pit built with beautiful and durable Manufactured Stone Veneer can add an enchanting and useful enhancement to an outdoor area. 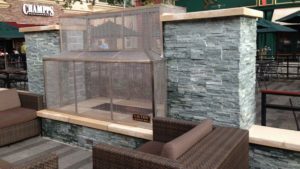 ProCoat Systems of Denver offers an extensive range of top quality stone materials to add a safe and attractive element to a homeowner’s backyard entertainment options. Landscape designers and homeowners should take extra caution to ensure the new firepit is properly placed. The first step is to check building codes in your neighborhood that sometimes restrict or specify the use of firepits. Some communities have a blanket ban on open fire burning. If the restrictions are manageable, the plan should ensure that the firepit is placed sufficiently far from other structures to eliminate the possibility of a fire spreading elsewhere. A rule of thumb is to place the pit at least 10 feet from any other structure. Make sure there are no trees limbs or and overhead wires directly overhead. Always check the weather conditions before starting the fire. High winds will carry embers away that can cause damage to surrounding structures, including your neighbor’s. To this end, make sure any nearby neighbors are agreeable to your proposed placement. Procoat Systems of Denver represents the finest quality Manufactured Stone veneer products available. The pavers are rugged and attractive, designed to match any style or stone type for fire pit construction. Once the design has established the diameter and firepit wall height, selecting the right manufactured stone veneer is simply a matter of taste and style. Boral® Cultured Stone® products replicate the look of many natural stone products but are one-third the thickness of natural stone products, less expensive, and easier to install. Boral products come in 21 textures and 100 different colors from which to select. Matching the surrounding décor and choice of style is simple. ProCoat has supplied manufactured stone veneers for fire pits throughout Colorado and surrounding states. ProCoat Systems is a leader in the hardscape and stone industry. The experts at ProCoat will be pleased to answer any questions regarding fire pit construction or any exterior or interior coating needs. Visit the ProCoat Systems website for ideas or call 1-303-322-9009. The post Create a Backyard Fire pit with Manufactured Stone Veneer appeared first on ProCoat Systems.